Borderlinx | Buy Hermes and ship worldwide with Borderlinx. Cheap rates guaranteed. Supreme elegance. Refined luxury. Hermes USA is the pinnacle of French class. Founded in 1837 by Thierry Herm?s, Hermes USA has been a family owned brand since its creation. Hermes USA takes pride in the superior quality of its creations and use of only natural materials. Established on the dream of travel, Hermes USA is historically a brand of travel goods, notably leather luggage. Today, Hermes USA produces leather goods, luxury ready-to-wear for men and women, jewelry and watches, fragrances, home goods and equestrian goods. Hermes USA Products are all made by hand, and by one person only from beginning to end. These principles dear to Hermes guarantee the quality and uniqueness of each product. Hermes USA Leather presents bags and luggage, wallets and passport holders, agendas, notebooks and other various accessories, made from only the finest natural raw materials from all over the world. On top of ready-to-wear, Hermes USA Men offers a collection of ties and scarves made of silk, cashmere, and other fine materials, and feature beautiful patterns and prints that reflect the beauty and luxury of Hermes creations. 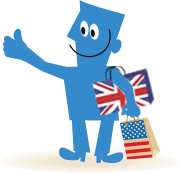 Now with Borderlinx you can buy Hermes in the USA and opt for cheap international shipping to your home country! Avoid any unexpected fees by paying international shipping, tax &amp; duties upfront, which you can calculate using our shipping cost calculator. A number of services are available through to make international ordering from Hermes USA hassle-free, including concierge, free repacking, and consolidation.